Three decades of ATV manufacturing experience has led to the KingQuad 750 AXi, Suzuki’s most powerful and technologically advanced ATV. Abundant torque developed by the 722 cc fuel-injected engine gives the KingQuad the get up and go that’s a must-have for Utility Sport ATVs. 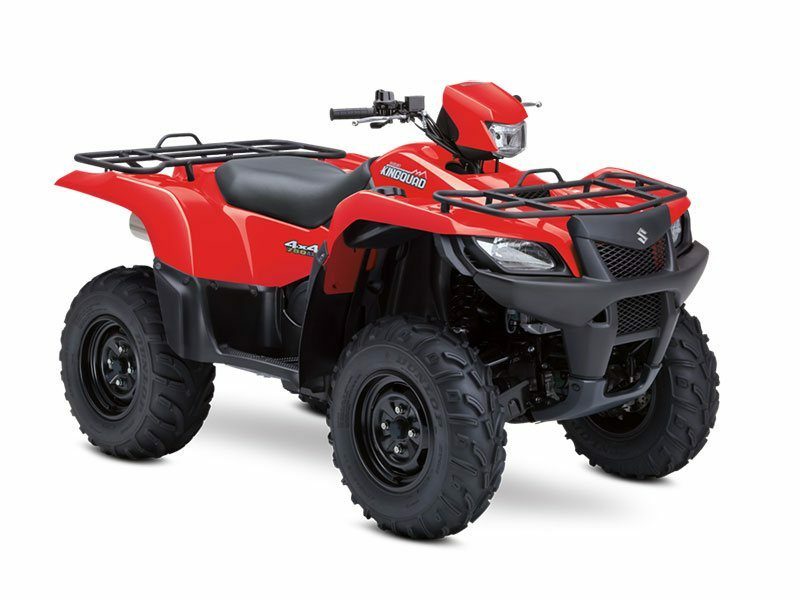 With an independent rear suspension, locking front differential, and a handful of other features, the KingQuad 750 AXi comes loaded with all the necessities to make sure you get the job done. If you’re looking for a utility sport ATV, find out what makes this Suzuki worthy of the name KingQuad. Pressed aluminum wheels for reduced unsprung weight. Fully independent, A-arm and I-beam rear suspension with long suspension travel (7.7 in. of wheel travel), includes large diameter shock absorbers with 5-way spring preload adjustment and large diameter rear sway-bar. 722 cc liquid-cooled DOHC four-valve fuel-injected engine tuned to deliver a mighty low- to mid-range torque along with a powerful high-rpm output. 722 cc liquid-cooled DOHC 4-valve fuel-injected engine tuned to deliver a mighty low-to-mid range torque along with a powerful high-rpm output. Compact torque-sensing limited-slip front differential offers more powerful traction plus light steering effort. A differential-lock system provides serious&nbsp;four wheel drive&nbsp;traction. Easy-to-read LCD instrument display includes speedometer (mile / km selectable), odometer, twin trip meters, hour meter, clock, fuel gauge, drive range. Distinctively styled 30W multi-reflector halogen headlights, and compact 5 / 21W taillight and brake light – additional 40W multi-reflector, handlebar-mounted auxiliary light. Large 4.6 gallon fuel tank positioned below seat for a low center-of-gravity includes vacuum-operated petcock, ratchet-style fuel cap and convenient bar-type fuel gauge. High output magneto generator system and 18 amp maintenance-free battery provides extra power. Large 4.6 gal. fuel tank positioned below seat for a low center-of-gravity – includes vacuum-operated petcock, ratchet-style fuel cap and convenient bar-type fuel gauge.